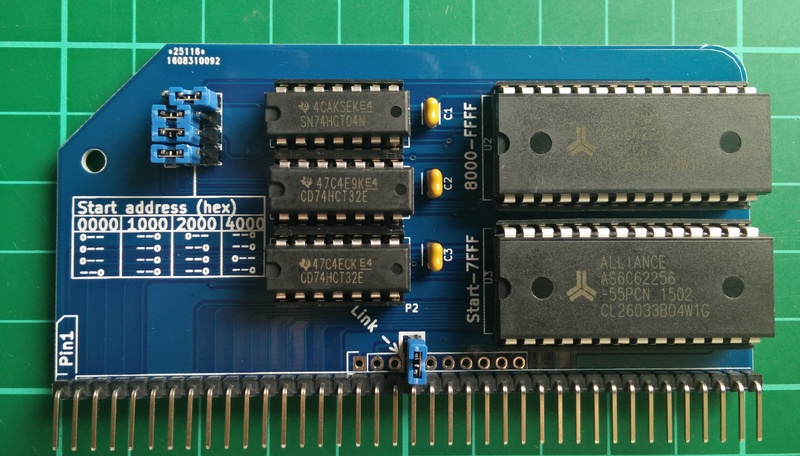 The 64k RAM module uses 2 62256 static RAM chips for up to 64k of RAM in the RC2014. Jumpers allow you to set it to only 32k, 48k, 56k or 60k if you wish so you can use 32k, 16k, 8k or 4k of ROM, and a page pin allows for the lower 32k to be disabled. For any other configuration, IC3 (62256) and IC5 (74LS32) and all the other jumpers need to be fitted. If address line 15 goes high, then /CE will go high, thus mapping this to address 0x0000 – 0x7FFF. This is the lower 32k. The /WE and /OE lines are controlled in the same way as the upper 32k. Because the lower 32k may well clash with addresses in ROM, address lines A12, A13 and A14 go through some OR gates and jumpers. These can be used to force the /CE pin high if a particular lower address space is used. For example, if using the 8k MSBASIC ROM, any memory requests that have A13 and A14 low (0x0000 – 0x1FFF) will cause /CE to go high, thus disabling the lowest 8k of memory. Or, to put it another way, /CE will only go low on IC3 if an address between 0x2000 and 0x7FFF is being called. The lowest jumper is for /CE override, to allow the lower RAM to be paged out. Normally this would be set high with a link soldered by the bus pins – however, if the jumper is in the 0== position, and the link removed, the lower RAM can be disabled by pulling the page pin low.